Sand cherry bushes are medium-sized ornamental shrub and members of the rose family. Among the many varieties of sand cherry, purpleleaf sand cherry (Prunus x cistena) is one of the most popular for its purplish red leaves that turn crimson in summer and bronze in fall. Short-lived at 15 to 20 years, all sand cherry varieties are prone to many pests and diseases, especially infestation by Japanese beetles in the summer months. Their growth habits are virtually the same, and so are their pruning requirements. Keep your pruning shears handy, because sand cherry bushes need a lot of attention. Prune sand cherry bushes at any time of year, whenever pests and diseases are present or the shape of the bush needs to be controlled. 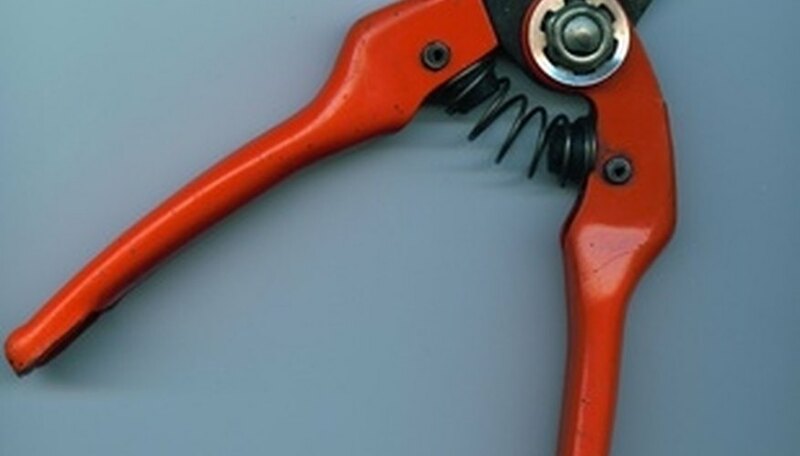 Sterilize the blades of your short-handled pruning shears and hedge clippers in boiling water to avoid transmitting infections to or from the cut branches. Leave the blades in the pot for 30 to 60 seconds to kill fungus and bacteria. Examine the branches and leaves of the sand cherry bush for signs of canker (fungus), insect borers (holes, wilting branches) and Japanese beetles (chewed, dead leaves). Clip away dead and diseased branches and foliage with short-handled pruning shears. Cut back to healthy tissue, or all the way to the base of the bush if necessary. Place infected material in a yard waste bag as you go to keep insects from escaping and fungus from releasing spores and spreading. Train sand cherries into a tree-like shape by clipping away shoots and suckers from the bottom third of the shrub. Trim tops and sides of sand cherry bushes with hedge trimmers to shape a formal or informal hedge. Rake up trimmed twigs and leaves and dispose of them in yard waste bags. Prune away long, pendulous branches in mature sand cherry bushes to prevent them splaying and giving the bush an unattractive, open center. Sterilize pruning equipment after use to prevent transmitting infection to other plants in your landscape. Plant or transplant sand cherry in the fall to reduce transplant shock and increase its chances of survival in the first year. Purpleleaf sand cherry bushes quickly lose their wonderful purplish-red color when planted in shade. Place them in full sun to partial shade for best results.